IT departments are seldom starting from scratch when they implement Secret Server. Users are already storing passwords in spreadsheets, personal password managers, and text files. You must ensure those passwords are not overlooked, and get all users on board quickly by importing existing passwords from other apps. Commonly used password storage techniques, such as spreadsheets, are notoriously insecure and have been linked to major breaches. Passwords often aren’t encrypted, and even if they are there is no option for two-factor authentication. Additionally, there’s no control over who sees which password. By securely consolidating spreadsheets and personal password managers you greatly increase your organization’s security and efficiency. See why using Excel to store passwords puts your entire organization at risk. 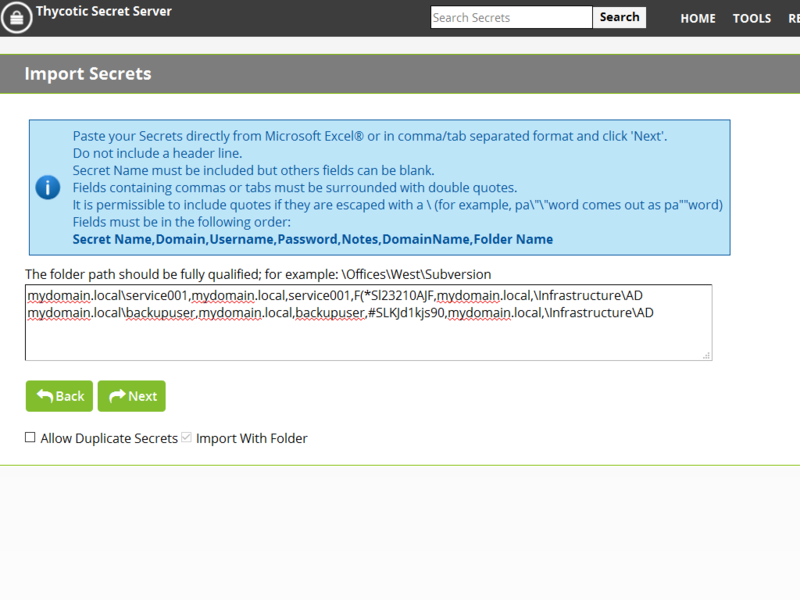 Secret Server’s Import feature simplifies integration with current and legacy systems and allows users to easily add large numbers of Secrets, or passwords, from an CSV or XML file. As Secrets are batch-imported by Secret Template, multiple types of input data must be imported in several batches. Do you need a more customizable solution? You can do custom scripting with Secret Server’s API web services to build out an import process from a third party or in-house application.